The Mariners busted out to a 2-0 lead, but gave up three in a ghastly fifth inning that set up Felix Hernandez to lose the first Opening Day game of his career. He gave up one hit, five walks and one HBP. The Mariners had a rousing start to their 40th season as Robinson Cano and Kyle Seager socked home runs in the first and second innings and Felix Hernandez threw hitless ball through four. But everything unraveled in a ghastly fifth when the Texas Rangers parlayed one bloop single (their only hit of the game), three walks and two errors into a 3-2 victory in front of 49,289 at Globe Life Park in Arlington, TX (box). Seattle entered the fifth with a 2-0 lead following solo shots by Cano and Seager. But Hernandez, debuting his blond chin whiskers in the regular season, suddenly lost his command. He walked Rougned Odor, Delino DeShields and, finally, former Mariner Shin-Soo Choo with the bases loaded for one run. Prince Fielder came through with his pop-up RBI single to right for another. An error on a routine grounder by shortstop Ketel Marte, following an error by Seager, allowed Texas to score the deciding run. After Cano and Seager went yard, the Mariners had two hits the rest of the way, both by new C Chris Ianetta, who went 2-for-2 with a walk . . . The home runs by Cano and Seager matched the number of lefty hitters to homer off left-handed Rangers starter Cole Hamels all last season . . . Leadoff hitter Nori Aoki went 0-for-4 in his Seattle debut, as did new first baseman Adam Lind, who fanned three times (the Mariners whiffed 11 times) . . .Korean Dae-Ho Lee came on as a pinch hitter in the seventh inning, but struck out with two aboard when the Mariners had an opportunity to retake the lead . . . The Mariners went 0-for-4 with runners in scoring position . . . The Mariners couldn’t solve Hamels, who fanned eight and walked three. Hernandez issued a crippling five walks plus a hit batter that, coupled with the Seager and Marte errors, proved his undoing. Hernandez lost for the first time in nine career starts on Opening Day. Hernandez worked six innings and threw 93 pitches, but 29 came in the fifth . 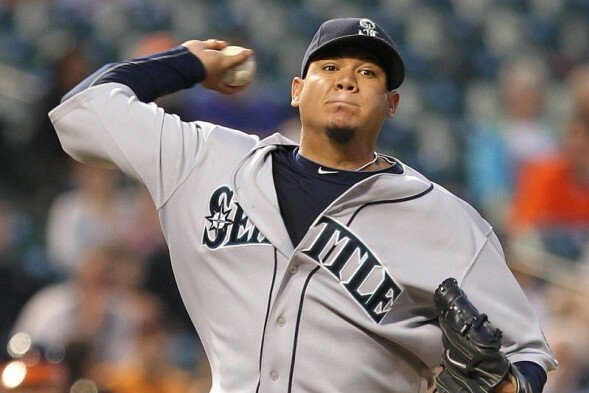 . . Seattle won each of Hernandez’s eight previous Opening Day starts, the most such starts by a pitcher without his team losing in major league history . . . LHP Mike Montgomery, making his big-league debut as a reliever, took over for Hernandez and struck out the side in the seventh in a hitless two innings. Montgomery had four strikeouts and one walk. “That was a tough one to start with. We had one bad inning. Felix lost command a little bit and we didn’t play well behind him. Other than that, our pitching was outstanding. Give credit to Texas. They figured out how to get the runs they needed. But we’re going to be fine. There were a lot of good things in that ball game, like Mike Montgomery.” — Mariners manager Scott Servais following his first game as the club’s skipper. “I was battling all game. Too many walks. I was wild. (The fifth) was tough, a long inning. But this is correctable. I just have to get ready for the next one. Got to work on my mechanics and stay back a little more” — Hernandez. The loss snapped Seattle’s streak of nine consecutive Opening Day victories. A 10th win would have tied the 1887-98 Boston Beaneaters for the most consecutive Opening Day wins in MLB history . . . The Mariners are 24-16 in 40 season openers, but 4-7 in daytime openers. The Mariners play 11 of their next 17 away from Safeco Field. The three-game series in Arlington continues at 5:05 PT Tuesday. RHP Hisashi Iwakuma goes for Seattle opposite LHP Martin Perez. Iwakuma is 8-3 with a 3.43 ERA in 14 appearances against Texas, including 13 starts. Usual issues. No one on base when Cano and Seager went yard. Aoki and Marte never got to base. Lind probably shouldn’t have played but I understand why Servais didn’t want to start Lee at this point. two days ago new Mc.Laren. F1 bought after earning 18,512$,,,this was my previous month’s paycheck ,and-a little over, 17k$ Last month ..3-5 h/r of work a days ..with extra open doors & weekly. paychecks.. it’s realy the easiest work I have ever Do.. I Joined This 7 months ago and now making over 87$, p/h.Learn. More right Hereo!414➤➤➤➤➤ http://GlobalSuperEmploymentVacanciesReportsJobs/GetPaid/98$hourly…. .❖:❦:❖:❦:❖:❦:❖:❦:❖:❦:❖:❦:❖:❦:❖:❦:❖:❦:❖:❦:❖:❦:❖:❦:❖:❦:❖:❦:❖:❦:❖:❦:❖:❦:❖:❦:❖:❦:❖:❦:::::o!414……. You better after Tuesday night? Welcome to “M’s Ball” Servais and Dipoto. The start of another long season. Just watched the second game. Care to amend? I’m all for the M’s turning around the past 15 years, but I have unfortunately become a skeptic. Remember, Lincoln is still running the show. Let’s check back Memorial Day. Meantime, here’s to the best. “my room mate Is getting paid HOURLY. ninety-eight$ on the internet.”….two days ago new McLaren P2 bought after earning 18,512$,,,this was my previous month’s paycheck ,and-a little over, 17k$ Last month ..3-5 h/r of work a days ..with extra open doors & weekly. paychecks.. it’s realy the easiest work I have ever Do.. I Joined This 7 months ago and now making over 87$, p/h.Learn. More right Hereo!488➤➤➤➤➤ http://GlobalSuperJobsReportsEmploymentsCutting/GetPaidHourly98$…. .❖:❦:❖:❦:❖:❦:❖:❦:❖:❦:❖:❦:❖:❦:❖:❦:❖:❦:❖:❦:❖:❦:❖:❦:❖:❦:❖:❦:❖:❦:❖:❦:❖:❦:❖:❦:❖:❦:❖:❦:::::o!488……..